In addition to our wealth of in-service training materials that assist health care providers in the prevention and control of malaria in pregnancy (MIP), Jhpiego also gets at the root of human resource needs by strengthening pre-service education. 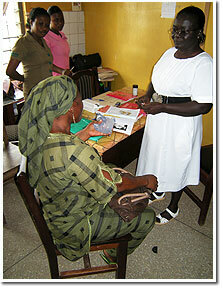 Our work with the Schools of Midwifery in Ghana is a case in point. Recently, the United States President’s Malaria Initiative (PMI) asked USAID’s Access to Clinical and Community Maternal, Neonatal and Women’s Health Services (ACCESS) Program, which Jhpiego leads, to develop a pre-service education package for Ghanaian midwifery tutors. PMI requested that ACCESS upgrade the MIP knowledge and skills of midwifery tutors working in Ghana’s 13 Schools of Midwifery and the School of Public Health Nursing. Before Jhpiego’s involvement, Ghana’s Procedures Manual for Antenatal Care—a basic resource for all midwifery tutors in developing curricula and learning experiences for their students—had not been revised or updated since 1995. However, in close collaboration with the Nurses and Midwives Council of Ghana, the Ministry of Health, donor agencies and professional groups, Jhpiego has now updated the manual to include current MIP interventions such as the provision of intermittent preventive treatment during pregnancy, the use of insecticide-treated bed nets, and malaria case management with artemisinin-based combination therapy. Presently, Jhpiego and the Nurses and Midwives Council of Ghana are organizing an MIP training workshop for midwifery tutors, two from each of the 13 schools. The first phase of the training workshop will be a technical update on MIP; the second will be an “Effective Teaching Skills” session that will enable participants to develop and implement their own MIP curricula. This year, more than 600 final-year midwifery students took their qualifying exams and will soon begin working in health facilities throughout Ghana. The Nurses and Midwives Council of Ghana is aiming to produce 900 midwifery graduates annually starting in 2011; this means that we can count on an up-and-coming workforce that will be skilled in delivering MIP interventions in the more than 950 primary care and district-level health facilities throughout the country.